"A pretty simple recipe, quick and easy to prepare, salsa criolla is the perfect accompaniment to many dishes. 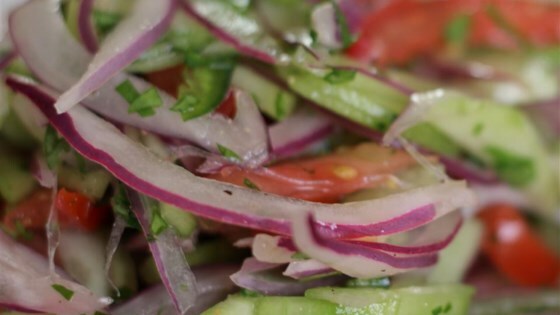 The lime juice is what makes this onion salsa/relish special. It adds a bright flavor that sweetens the onions and livens up everything else on the plate. Great summer dish! Store in the refrigerator for up to 2 days." Fill a bowl with water; stir in salt until dissolved. Add red onions; let soak for 10 minutes. Drain and pat dry. Mix onions, cucumbers, tomato, rice vinegar, lime juice, white wine vinegar, jalapeno pepper, cilantro, olive, and black pepper together in a large bowl. Cover with plastic wrap and let marinate at room temperature before serving, about 30 minutes. Substitute chopped parsley or basil for the cilantro, or use all 3. Nutrition data for this recipe includes the full amount of salt. The actual amount of salt consumed will vary. Super tasty! Made as recommended. You can add a sprinkle of Italian Seasoning for a slightly different flavor. Thanks for a great cold salad idea! This was ok. The flavor was extremely mild.